We partner with you to create a great C-store fit-out that will increase your sales. You benefit from our expert knowledge from over 30 years' experience with some of the world's most recognizable C-store brands. We understand how to influence your customers' purchasing decisions through compelling food and drink display, intelligent customer flow and maximizing purchasing hot spots. We make it easy from beginning to end, offering design, manufacturing, installation and ongoing support. 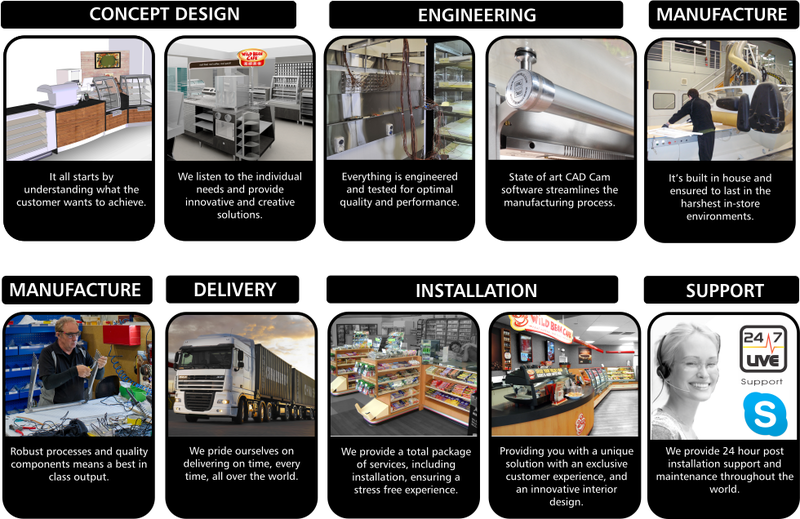 Our design and manufacturing teams work with you to address your specific C-store needs, and we continue to maintain and support our fit-out after installation. Our quick response time and ongoing cost efficiencies save you money, and round-the-clock support and cabinet monitoring means we back you up every step of the way.